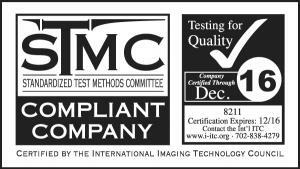 The STMC (Standard Test Methods Committee) has developed and implemented standardized test methods for the toner cartridge remanufacturing industry. 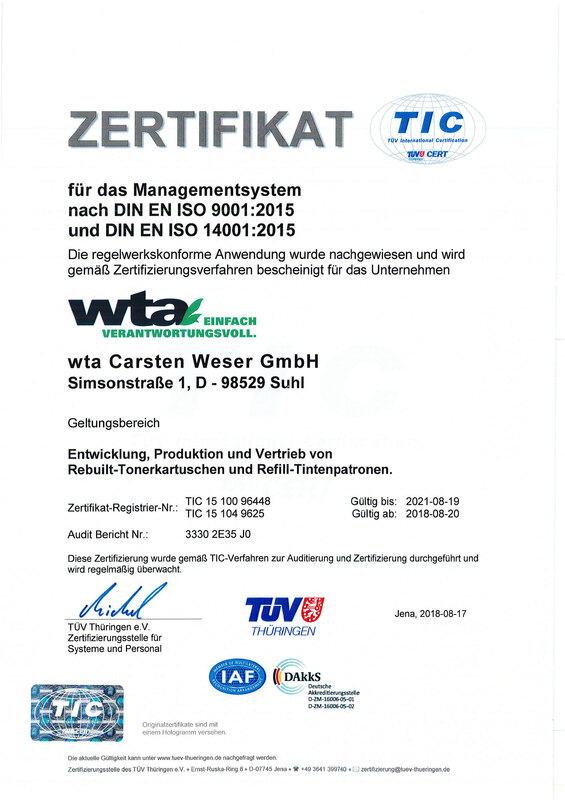 By means of the by STMC developed test procedures, various “test parameters on quality” of the toner cartridges are determined in a standardized way and a comparability with other certified compa­nies is guaranteed. 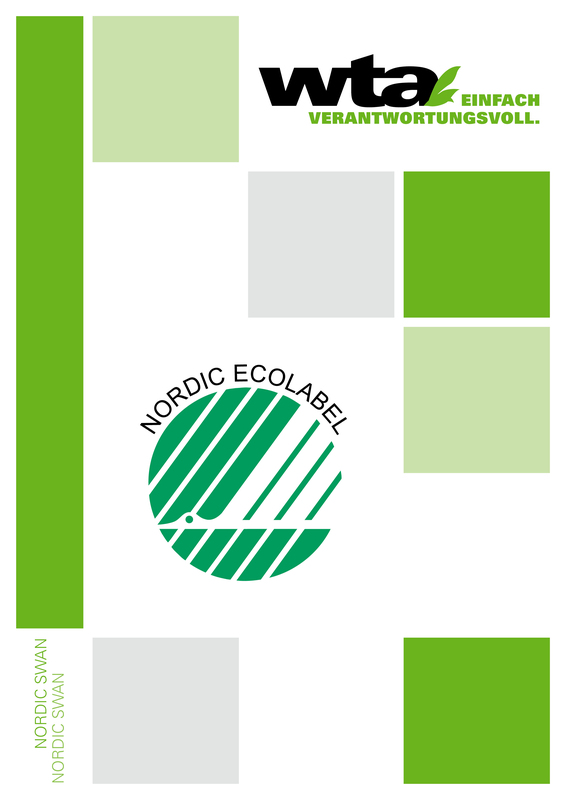 The eco-label adds great importance to the reduction of waste, the reduction of energy and raw material consumption during production which contributes to a lower impact on our environment and nature. The fade-proofness is a characteristic of print media (e.g. toner) demanded in the standing orders of notaries (DONot) and others. Resistance to wiping: the printout must dry fast. Erasability: the printout must not be correctable. Removability: printed texts must not be removable without leaving traces. Lightfastness: printouts must not fade more than to a certain dimension. Waterproofness: being touched by water the print must not blend in a dimension that makes the contours being invisible. The check-criteria necessary for this case are defined in the ISO 12757-2 standard. A test and certification of fade-proofness is always applied for a particular combination of a type of printer, the used paper and cartridge. 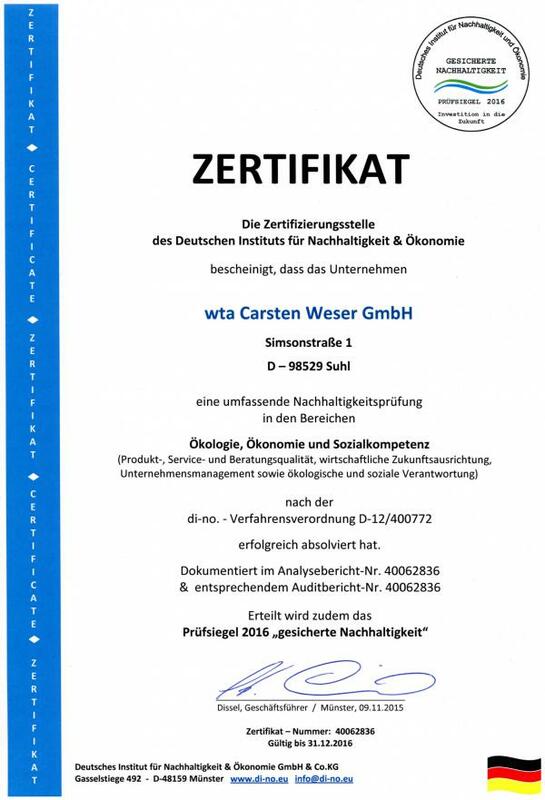 A certificate will only be issued for that particular and comprehensible combination, defined at testing. In case of changes (e.g. advancement, change of ingredients) to one of the tested media a fade-proofness cannot be warranted furthermore. 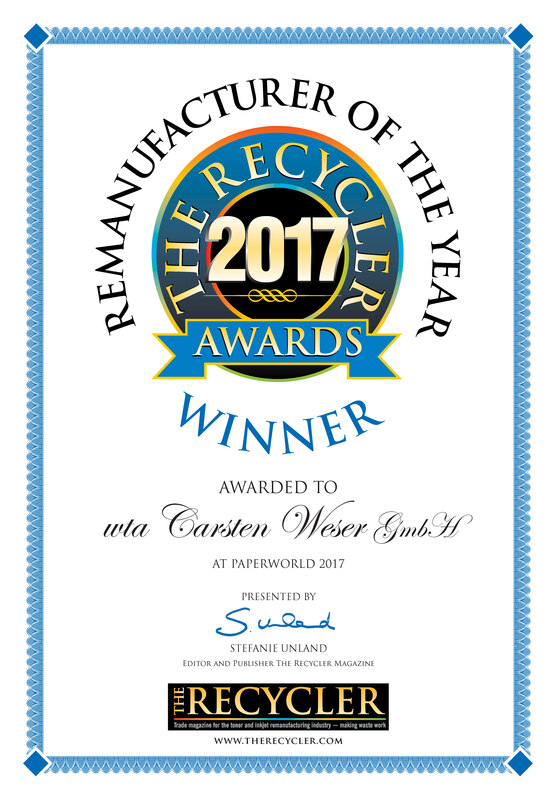 Since each manufacturer tries to improve his products constantly or to adapt them to market demands a certification is often not comprehensible anymore after some time and thus obsolete. 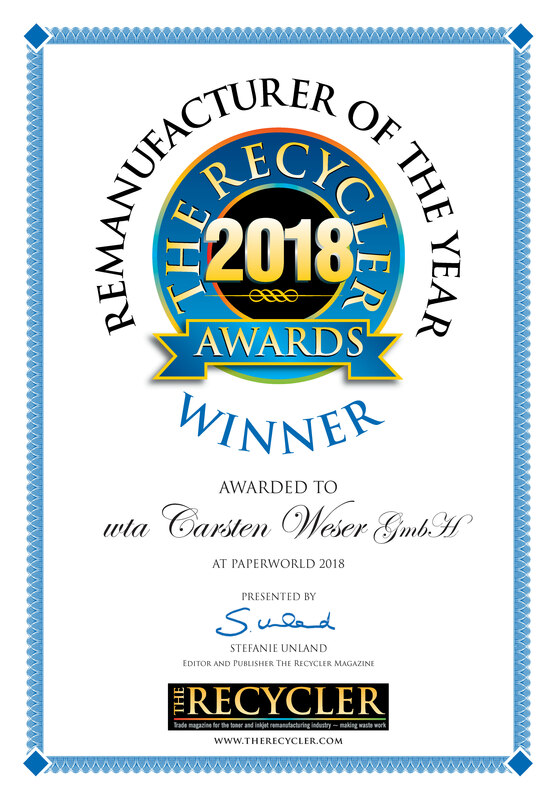 For us as a manufacturer of rebuilt toner cartridges it is even more difficult because we need to be provided with an approval for the test and certification by the printer and paper manufacturers. Due to the fact that the printer manufacturers and we are direct competitors, it is obvious that we will probably never be provided with a sufficient approval. 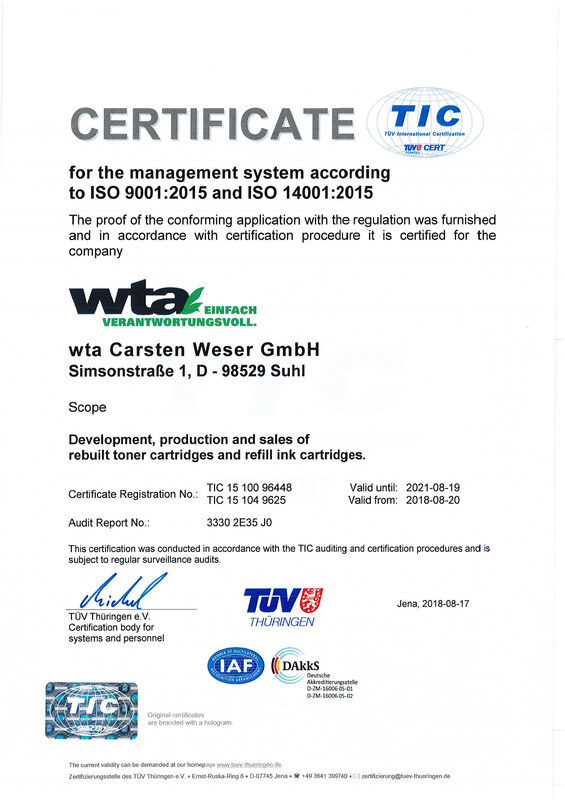 A certification of our products by the issuing institute is thus nearly impossible for us as a manufacturer of rebuilt toner cartridges. 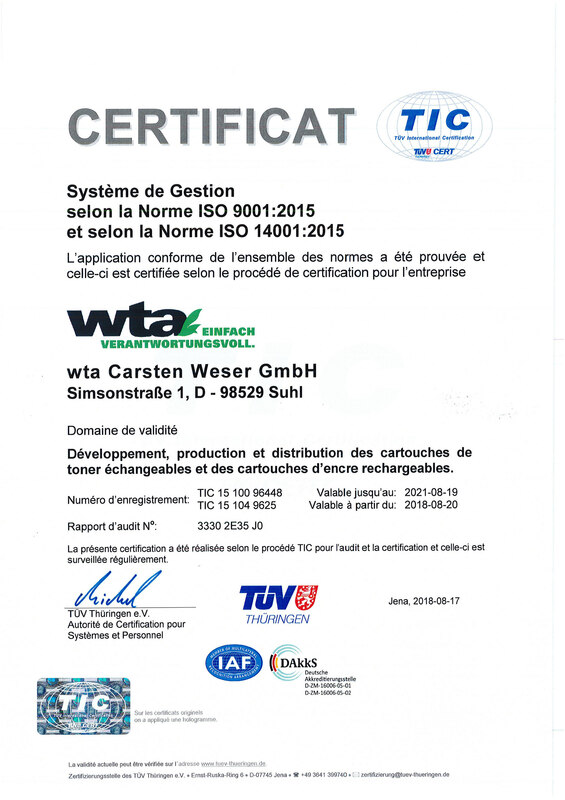 wta Carsten Weser GmbH confirms that the rebuilt toner cartridges produced by us completely fulfill the criteria for fade-proofness, such as blackening/brightness, toner adherence and abrasion stability. Appropriate test procedures (fold assessment, visual assessment by the tape method following DIN-53223 standard) were completed successfully following the demands of the DIN-33870 standard. 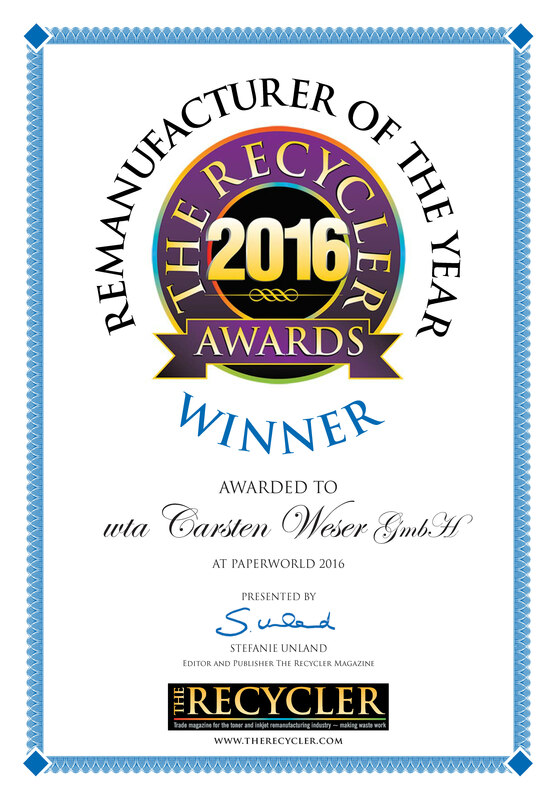 We provide a 3 year warranty for all our products.